Sonically this Busato is rather unique. Despite what I said about Busato's lacking mids, this highly unusual example produces the sort of rich, complex mids one would expect from some of the finest Selmer guitars. 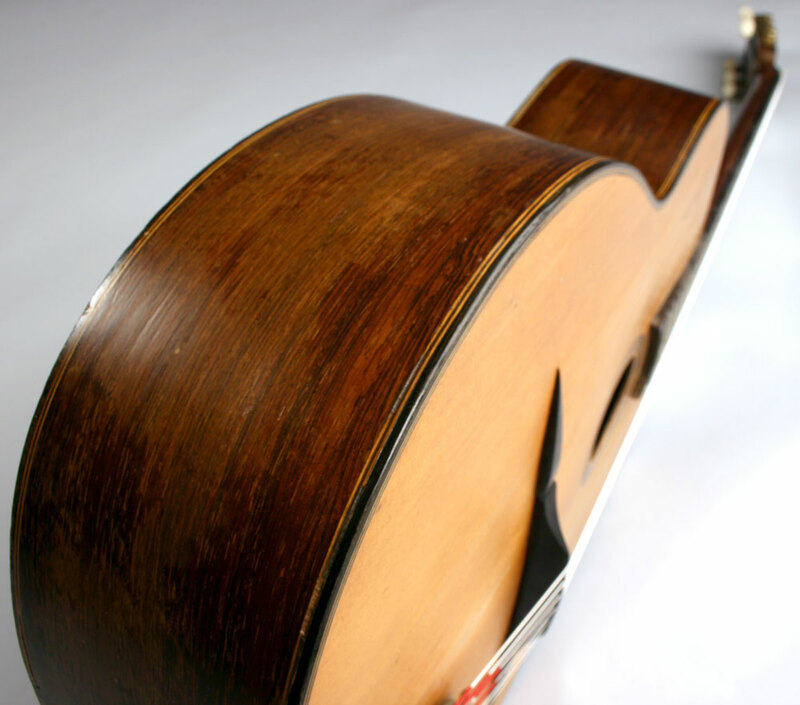 The enhanced midrange of this guitar adds a wonderful thickness to single note lines, producing a tone similar to that of Django's famous recordings with Selmer #503. The outstanding thing about this instrument is its ability to produce such a rich tone while still maintaining the volume and bark normally associated with its brasher Busato cousins. These qualities lead me to believe that this may be the most well balanced sounding Busato in existence. Either way, its tone, playability, and projection certainly rank it the top 1% of Gypsy guitars and it could easily take a lifetime to find another guitar that sounds as good. 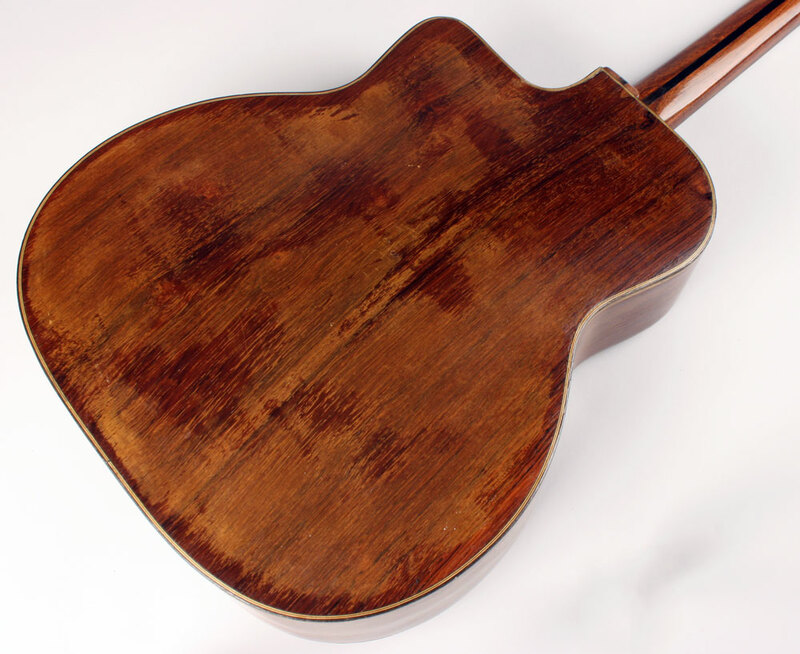 This guitar has Brazilian Rosewood back and sides, a spruce top, and a three piece mahogany neck with an ebony spline in the middle. 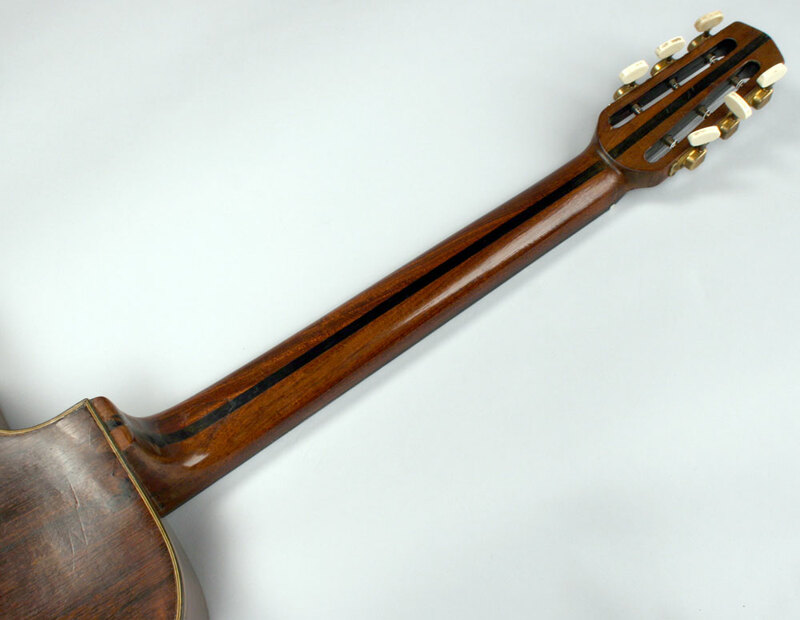 The top is actually 4 separate pieces of spruce which is very common for Busatos. So many of the "cracks" you see are actually the seams of the 4 pieces. 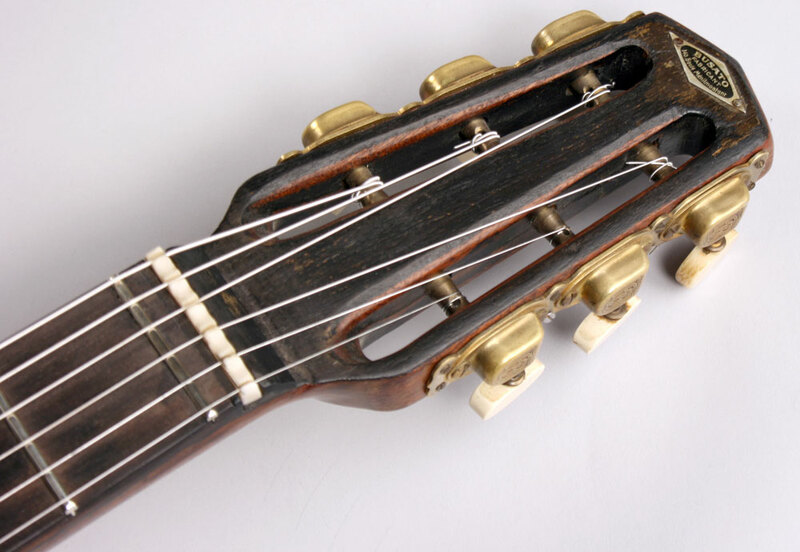 This guitar has the original BB tuners and tailpiece. They are in the best condition I've ever seen. It should be noted that there were many, many Busato models. Many of which seem to be experiments. 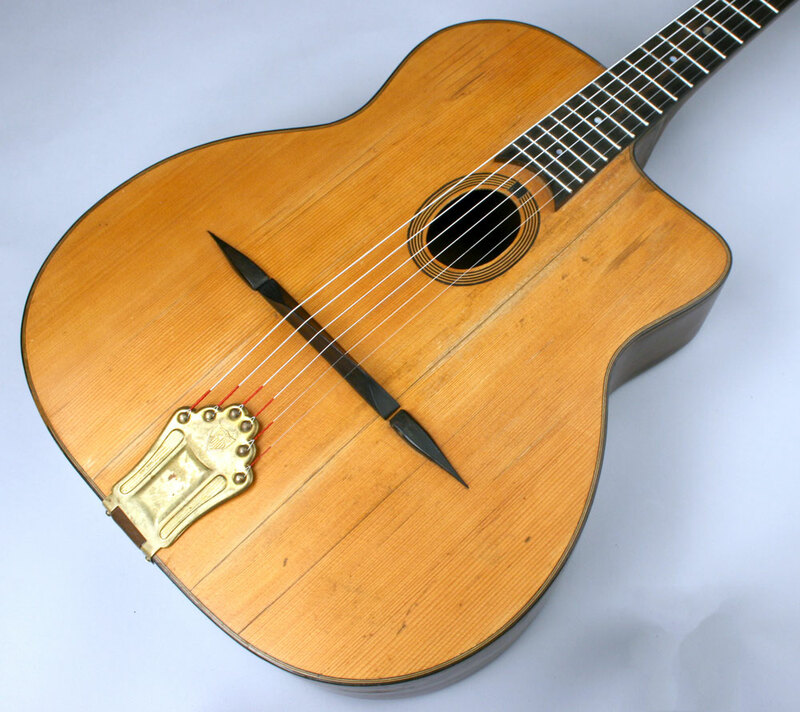 This model, which is often referred to as the "Grand Modèle" (oval hole, 14 fret neck), is the one preferred by the pros like Stochelo, Romane, Moreno, etc. Busato's catalog lists this model as item #44. This guitar is currently strung with Argentine 11s and is incredibly easy to play. It plays like butter with no buzzes or other sonic problems. Action is shockingly low at 2.5mm! Very few new guitars can get that low and still sound good. The condition of the guitar is excellent. It's in the best condition I've ever seen for a Busato. Just some minor wear, scratches , and checking. The neck appears to have been reset. There are some top cracks and seams which opened up which have been surface repaired (cleats weren't necessary.) The neck was recently replaned and the frets are new. Overall, a very good looking guitar considering it's age. This guitar has the original Busato label on the neck block AND the metal name plate on the headstock. Usually, Busatos have one or the other...and often nothing at all. The paper label on the neck block has the Cité Griset address and the metal plate has the Boulevard de Ménilmontant address. 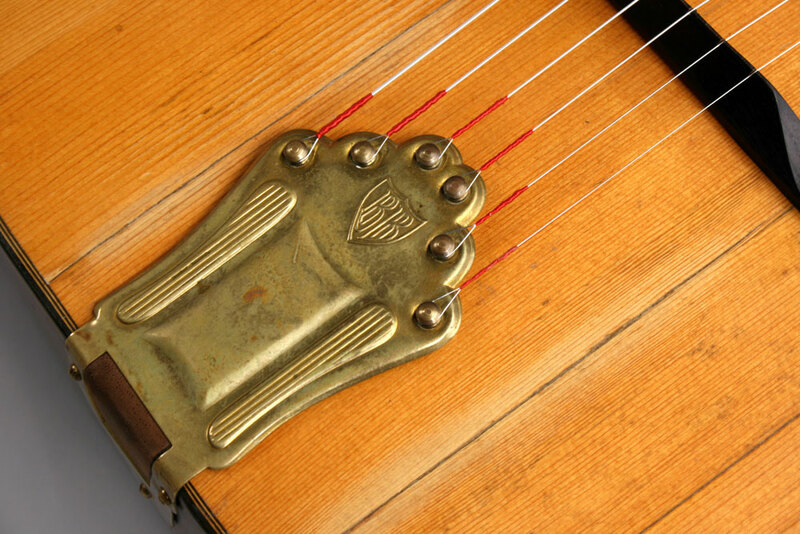 This is an unbelievable instrument. Just got it, and it was exactly as described on the site. Hard to believe that this guitar still looks and sounds this good at age 70+. The resonance, playability, and overall tone is incredible. This guitar frankly deserves a much better player than me, but as my wife says, "just appreciate and enjoy the spirit of the instrument", and I plan to do exactly that. I've been playing this guitar for years... amazing sound, awesome! This Axe is like the beautiful sister sibling of Michael's guitar. It is warmer and rounder in its mids, a little less aggressive but equally awesome. Chords sound lush and notes sound rich and full. #44 is what I would want in the recording studio and #45 is what I would want in a live setting with multiple guitars...Not possible to compare beyond them both being incredible examples (the 2 best I have played) of Busato's builds. Enjoy!